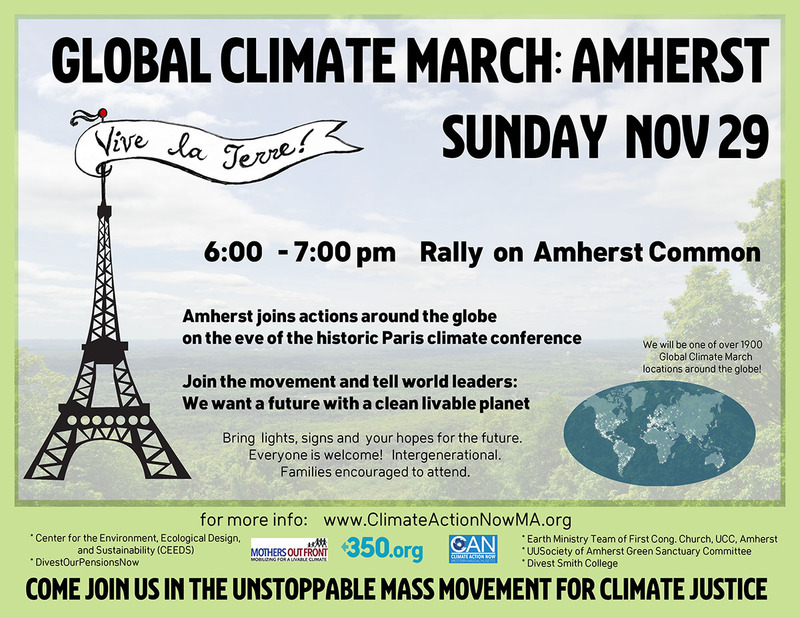 Nov 29 Global Climate March: Amherst, Northampton, Spingfield, Athol Join 2,330 actions around the globe! On the eve of the big U.N summit in Paris, the climate movement is taking to the streets. With climate change in the global spotlight, this is our chance to make the talks work for our movement. This is our chance to set the agenda for ambition. Our message: keep fossil fuels in the ground and finance a just transition to 100% renewable energy by 2050. Please help spead the word! by sharing and rsvp’ing these facebook events for northampton,amherst,springfield! We invite folks Join the March – bring signs and banners; read a short message or sing a song; bring hand drums, string or wind instruments; or just come to witness and support the March. Many of the major environmental and Climate Justice Action groups in the North Quabbin Region have joined as Sponsors of the March, including: Earthlands, North Quabbin Energy; NQ Pipeline Action, Mt. Grace Conservation Land Trust, Sacred Earth Network, Ritual Expressions, N.Q. Women in Black, Petersham Energy Committee, Ritual Expressions, Common Grow, and many others. Speakers and musicians are getting lined-up. After the March, all are invited to the Annual Earthlands Thanksgiving Potluck & Gathering at 39 Glasheen Road, Petersham, MA 01366 for good food, amazing music, stimulating conversation, and inspiring community.